After a thorough tutorial which covers combat, crafting, weather and numerous other things that all seem pretty important, I found myself waking up by a knackered ship with no massive pointers of what to do and where to go. I had a wander round, gathering anything I could find. I drank some salt water and got thirsty, so went looking for fresh water to sort that out. A little while later I got hungry, so munched on some berries I’d gathered. Then I got attacked by a couple of wolves which highlighted how hammering the attack button is far from the best way to fight – I got tired quickly and had to hide while I gained some energy back. Then it went dark, and I still had no idea where to go. Eventually, by pure fluke, I found my way to a camp fire and things got started properly. But after this opening session I was already feeling the effects of such a lack of support. I didn’t know if I liked it. But it didn’t take long to see the benefit of this system. I started to use landmarks as pointers, be that a big mountain, a tree next to a fork in the path or a sequence of signposts. The map was just that – a map; there’s no sign of where I was, where I was going or what I’d find there. When night fell I needed a lantern to have any idea what was any more than a foot ahead of me, and when I was in a hot or cold area I needed to dress accordingly. But I couldn’t just fill my bag full of clothes and weapons to cover all eventualities, otherwise I’d have no room for essential supplies for when I got injured, hungry or sick. I needed to make sure I could cook food so I wasn’t eating raw meat, but at the same time couldn’t batch cook otherwise it’d go off and be dangerous to eat. 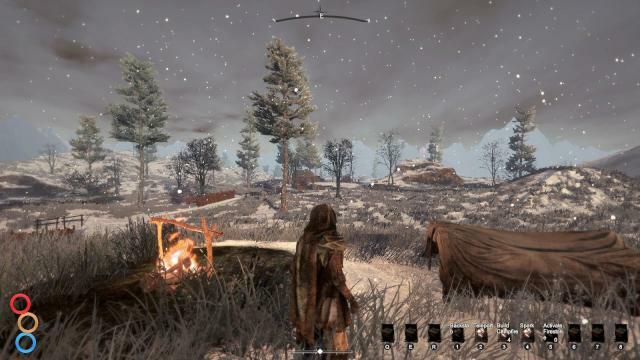 In these respects, Outward often feels more like a survival game than anything else. But this brings about another interesting result from this lack of in-game support, and that’s that it feels really cool whenever something works out. Managed to walk a decent distance including an overnight stop under a tree and a fight with a couple of bad guys, all without getting lost? That’s impressive. Managed to complete a quest to fetch a load of stuff which left you hopelessly underprepared for any inevitable fights? Nicely done. Everything feels like a success. Well, everything except getting beaten in a fight, but even then you never die. Yeah. Outward constantly keeps itself up to date with your progress, so there’s no reloading of old checkpoints when you get a bit over excited and try to take on 20 bad guys at once while armed only with a shield. You get beaten, and end up taken off somewhere until you wake up and try to work out where you are. Maybe you’ve been imprisoned and need to figure out how to escape, maybe you’ve been taken off to a remote camp, or some other annoyance that will delay you on your missions. But you’re not dead; you just have to learn from your mistakes and try again later when you’ve beefed up a bit and learnt a few spells to help you out. It also pushes you to explore more too, offering up new areas that you might not have generally found or spent time in otherwise. And being such an open area with no map markers to distract you, it’s easy to lose hours to just wandering round and finding cool stuff. Its not on Skyrim levels of discovery, but there’s a load to find and do nevertheless. But even if you can stomach and master the difficulty that all of these challenges presents to you, there’s one thing that might put a few people off spending huge amount of time with the game: it doesn’t look great. Character models aren’t overly detailed or well animated, and the general quality of the textures and visuals around the map aren’t anything to write home about. I get that not every development team has the resources to be able to make a game on the scale and with the same graphical wizardry as something like Red Dead 2 or Horizon Zero Dawn, but as we nudge closer to the end of the PS4’s main life cycle there are plenty of games that offer a prettier experience than this; it can be quite off-putting at times. But, back on the plus sides, it’s got local split-screen co-op. While not something I tried out myself, it’s such a rarity nowadays in any game never mind an RPG that it’s potentially a reason by itself to pick it up, and if you’ve got a friend or relative who you’ve always wanted to take on an RPG with but never had the chance it could be the master-stroke that sells it to you. 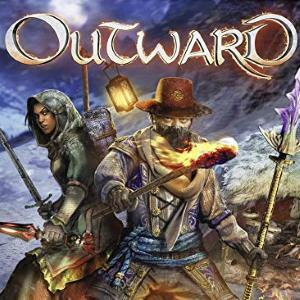 But on the whole, I’m still not entirely sure whether or not I enjoy playing Outward. I can see the thinking behind taking away all of the usual scaffolding that these games offer, and I applaud that choice on the grounds that a lot of people will love it. I also enjoyed the exploration side of things, having all the time in the world to wander and find stuff, and as long as I could protect myself and keep myself healthy I could spend hours wandering round just seeing what I could find. But at the same time I could often spend half an hour not finding anything, just experiencing the long, often arduous life of an explorer, where some days are just travelling around and surviving as opposed to having much to get excited about. What I am sure about however, is that the game under all this isn’t bad at all. I wasn’t entirely sold on it, but that’s a reflection on my reliance on modern support in games more than the game itself. If you can handle the lack of hand holding and fancy something to sink your teeth into without worrying about the game’s presentation then this could be a very decent purchase for you.